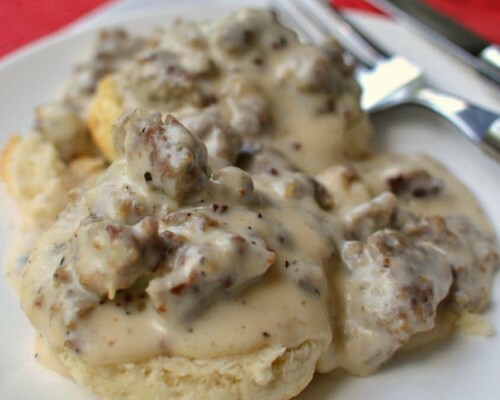 Southern style Biscuits and Gravy are the ultimate comfort breakfast. In a couple of easy steps you can learn how to make Biscuits and Gravy recipe in no time at all. Breakfast is by far my favorite meal of the day. It is also very important to get that motor running early in the morning. Now we don’t eat Biscuits and Gravy every morning around here but on special occasions we like to treat ourselves to this amazing meal. This memorable breakfast was on Father’s Day because it is one of hubby’s favorite breakfast choices. Is breakfast one of your favorite meals? I thought you would never ask! 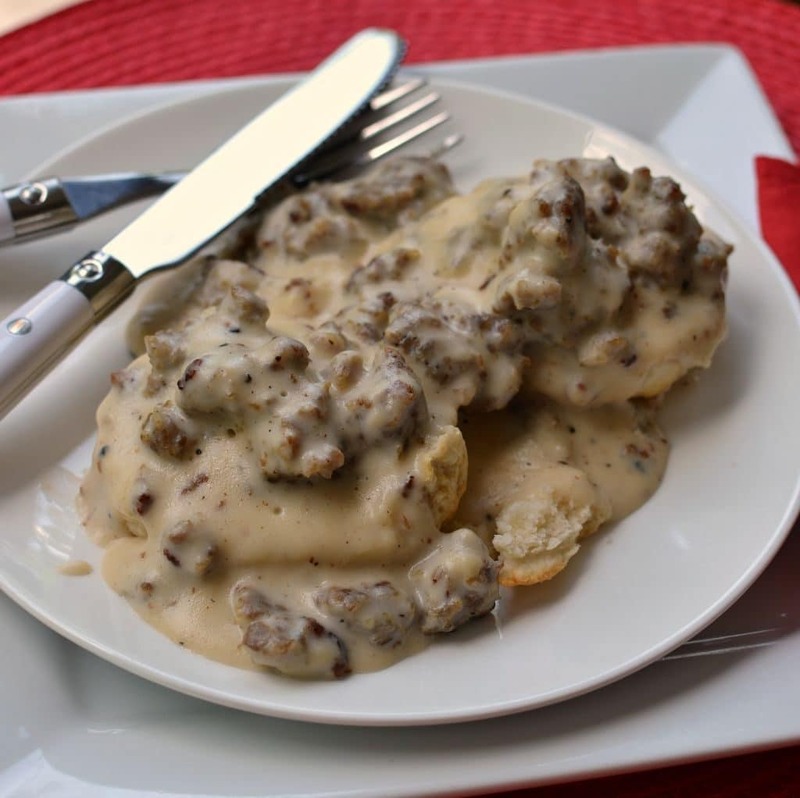 They are fresh homemade country style biscuits (the kind you would have with fried chicken) covered with a creamy pork sausage gravy that is very simply seasoned with salt and pepper. It you have never tried it or made it fresh at home I suggest you do so as soon as possible. It is delicious! How to make Biscuits and Gravy. Let’s start with the warm mouthwatering biscuits. The flour, sugar, baking powder and salt are sifted together and then placed in a food processor. The butter is added one tablespoon at a time and pulsed. Pour back in bowl that you sifted in and slowly add milk until rough ball forms. Place on flour covered surface and pat out to half inch thick, let rest and then cut biscuits with glass or biscuit cutter and bake. Piece of cake or this case a cookie sheet full of homemade fresh biscuits. Now for the gravy! Brown good quality bulk breakfast sausage. I personally like to leave mine a little chunky but you can break it up real fine if you like. Remove that browned sausage to a plate, wipe the pan clean and add the butter to melt. Whisk in flour and brown for a couple of minutes. Slowly whisk in milk and cook until slightly thickened. Add sausage back to the pan and season with salt and pepper to taste. See what I mean! Not difficult at all. Now you have fresh homemade biscuits and gravy! Weekend is on it’s way! You need to get this on the Sunday breakfast menu. You and yours are going to love it! If you have been following me for anytime at all than you know I am a huge breakfast fan. Here are some more delectable breakfasts for your repertoire. 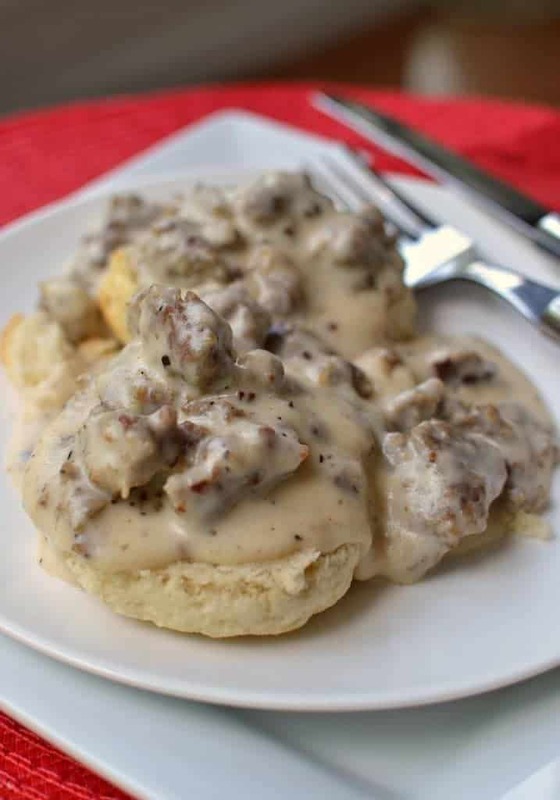 Southern style Biscuits and Gravy are the ultimate comfort breakfast. 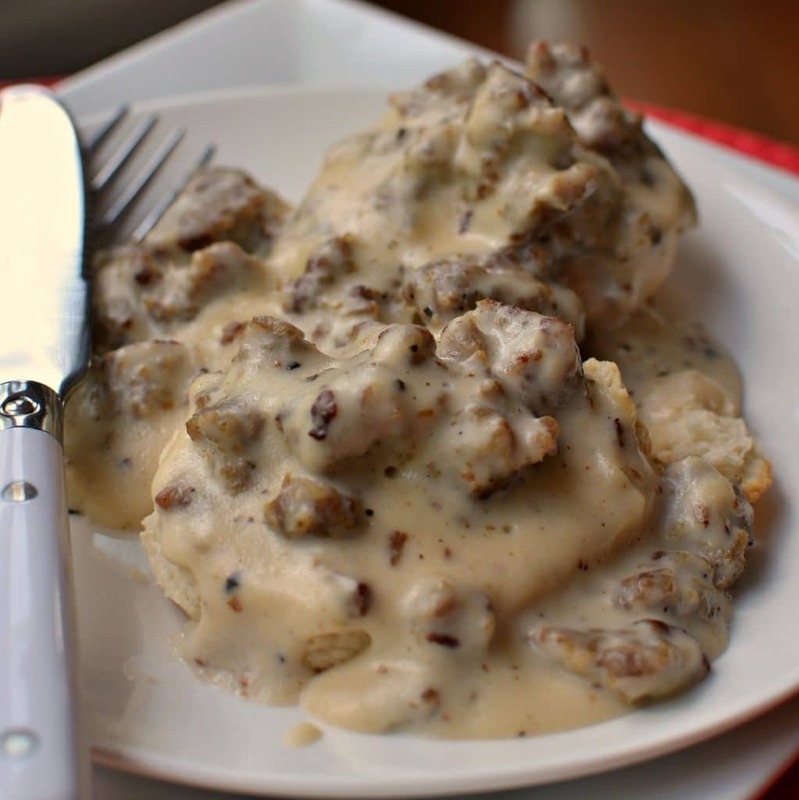 In a couple of easy steps you can learn how to make Biscuits and Gravy too. In a medium bowl sift together flour, sugar, baking powder and salt. Add contents to a food processor and pulse in butter one tablespoon at a time until it starts to get crumbly. You can also cut in butter with a pastry knife. Return back to bowl and slowly add milk until rough ball forms. Pat out dough onto lightly floured surface to about 1/2 inch thickness. Cover with towel and allow to rest for 20 minutes. Cut with standard biscuit cutter or round drinking glass. Bake at 425 degrees for 12 minutes or until lightly browned. Brown pork sausage and remove to plate. Wipe skillet clean, Melt butter over low heat and whisk in flour. Continue whisking flour for about 3-4 minutes. Slowly add milk whisking continuously until desired consistency. Add sausage back to the pan and season with salt and pepper to taste. Cook for 5-10 minutes over low heat. If gravy thickens too much add 1/4 cup milk.